Planning a Kitchen Remodel in Valparaiso, Indiana? 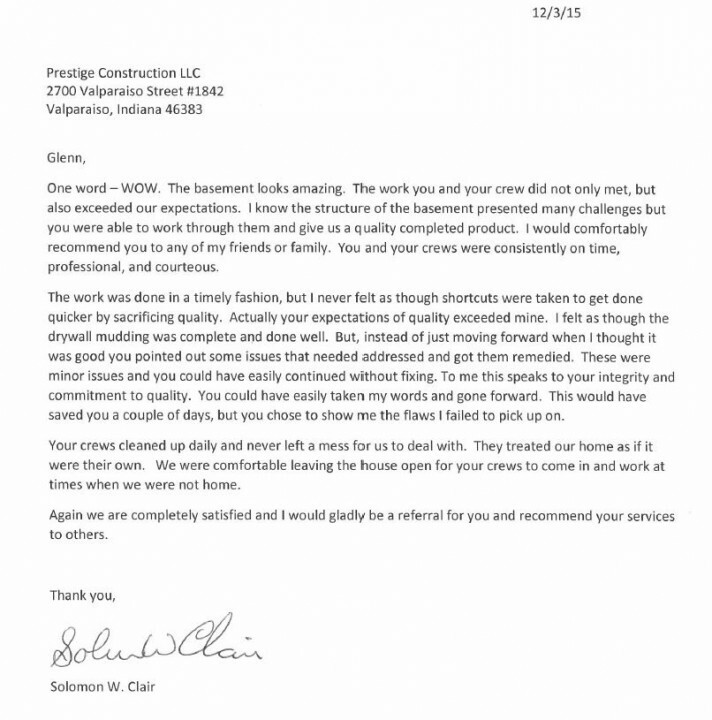 Homeowners in Valparaiso, IN have been trusting Prestige Construction LLC to create their dream kitchen for years. Professional advice and expert installers make Prestige Construction LLC the leading choice for kitchen remodeling in Valparaiso. Whether you're planning to replace kitchen cabinets, install fresh countertops and upgrade appliances or renovate the entire room from plumbing fixtures to flooring, Prestige Construction LLC has the expert advice you need. They're ready to tackle any kitchen remodeling challenges that Valparaiso homeowners face, and offer quality materials for every taste and budget. Kitchen renovations can get expensive, but these home improvements can also add incredible value to your property and make daily living better. The design staff at Prestige Construction LLC focus on creating value for your Valparaiso kitchen remodeling investment, ensuring your new space remains comfortable and appealing for years. Having worked in Valparaiso, IN for many years, they also know what fits into the local real estate market, offering an advantage should you ever put your home up for sale. The best kitchen renovation covers the big picture of design and space without leaving out the tiny details. Prestige Construction LLC always works hard to ensure every Valparaiso kitchen remodeling project is tailored to the client and includes a well laid out design with custom details tucked in. Space saving cabinets, energy efficient fixtures and personalized decor touches are all part of the job for Prestige Construction LLC, as many Valparaiso homeowners will confirm. Get the help of a local professional on your side and create the kitchen of your dreams. 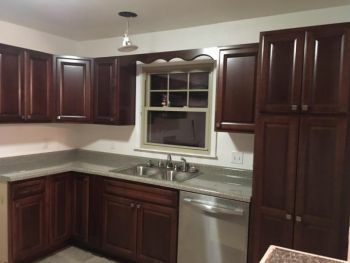 The expert contractors at Prestige Construction LLC have proudly served homeowners across Valparaiso, IN for years, making countless kitchen remodeling dreams come true. Call Prestige Construction LLC at (219) 213-6336 today to start the ball rolling on your own kitchen renovation project. 5★★★★★ - "Check out the link to this Animoto video of the awesome story of our Prestige Construction experience in our recent remodel. Prestige rocks!! 5 ★★★★★ - "My family and I have used Glen Foreman's company; Prestige Construction for many years and will continue to do so for many more. Most recently, Glen's crew completed a nasty, dirty, spider-filled, crawlspace project under my house during a heatwave and then followed by severe rain and flooding. His workers were knowledgeable, courteous, and on time everyday. They were often covered in mud and muck but did so with zero complaints. Prestige Construction does an outstanding job and I highly recommend them to anyone who is looking for a top notch construction crew that is dependable, trustworthy, knowledgeable, affordable and just AWESOME overall!" 5 ★★★★★ - "I have used this company twice now. They are very friendly and knowledgeable. Glenn Foreman is on top of things here. I needed some last minute work done and he came to my rescue, all the requested repairs were completed in less than two weeks for both jobs. The only regret I have is that I did not come across them sooner. My partner and I recently hired a different company to remodel our home and was not only unimpressed but very unhappy. I really wish we had used this company instead.Thank You so Much for all your help and the wonderful job." 5 ★★★★★ - "My husband and I were extremely pleased with Glenn and his crew. They went above and beyond our expectations! There was attention to detail, and they cleaned up after themselves. We would highly recommend them!" 5★★★★★ - "Prestige Construction trusts its professional employees with a large degree of responsibility and matches the trust with very thorough procedures. The team on a project is always professional, committed and qualified. Glenn Foreman, who manages this company, builds vibrant personal customer relationships by communicating openly and honestly with each. Recalling my preceding experience of working..."
5★★★★★ - "Glenn came and helped us realize our dream to finish the basement. His team (Jeff and Matt) were professional and courteous. They did a great job, and explained each step along the way. These gentlemen worked long hours to assure that the job was completed with the highest degree of quality and on time. I would highly recommend working with Prestige Construction, and may use them again for future projects." 5★★★★★ - "Siding looks great, very professional." 5★★★★★ - "Very well done project - completed on time and within budget, and cleaned up afterwards. Very responsive to any requests while the work was going on with a very simple and easy to understand contract - I will use him again." 5★★★★★ - "The guys were prompt and finished the job on time. I will be using them in the future for other small jobs." 5 ★★★★★ - "We worked with Prestige Construction to have our kitchen opened up and take down some walls. Glenn and his team were wonderful to work with! Everyone was very friendly, polite, and cleaned up when the day was done. Glenn was always in communication with us throughout the project and stayed on schedule. We will definitely be working with Prestige Construction again in the future!" 5★★★★★ - "When we decided to have our kitchen remodeled, like many others we had a few companies come out to provide us with estimates. From the moment Glenn came to meet with us, he made me feel at ease! He understood the vision I had for our kitchen! He is very experienced, very hands-on, great communicator and honest with very fair pricing! The people that compose his team are hardworking and detailed..."
5 ★★★★★ - "My first experience as a landlord I employed Glen and his company, prestige, after several quotes. He was the most knowledgable and competitive quote. During the rehab of my rental property, he was in constant contact with me for those popular unscheduled / foreseen problems. He gave me several options for my circumstances as he also has had experience as a landlord as well. The people Glenn employees did an excellent job on the many various jobs required to update my dilapidated property. Glenn and his crew had no problem informing me, counseling me and fixing any unforeseen problems that usually occur during the process. When the job was done to my satisfaction Glenn followed up flawlessly. Empire carpet came in and scratched up the newly painted bathroom wall and Glenn fixed it free of charge. He also was available almost 24/7 for questions and concerns. I was completely happy with Glenn and his entire crew. I will definitely use Glenn and Prestige again! Thanks you so much Glenn!" 5 ★★★★★ - "We couldn’t be happier with the work Glenn and his crew completed. They removed and replaced all the siding on our 2 story chimney and also some above our garage door. Both jobs encountered many snags along the way. Not once did the crew complain and worked through some extremely hot days on top of it. They also replaced a bathroom window a couple of weeks later that we absolutely love!! They maintained a clean environment both inside and out during both jobs. Their attention to detail went well above and beyond our expectations. Glenn and his crew are hard working, extremely knowledgeable and very respectful. We plan on using Prestige Construction for our bathroom remodel in the future." 5 ★★★★★ - "We are extremely happy with Prestige Construction! They are very knowledgeable in what they do!!!! My bathroom is very tiny and it was quite the nasty job, but they came in and made it gorgeous! I also feel they are priced very reasonable! They even called and asked before they did something when a problem came up! They didnt just do it. They answered all our questions and they were all extremely friendly!!!! Glenn even answered questions on the weekend even though it was his day off! We appreciate and love the job they did and will always go to them when we need something done! Thank you for all you did! The Meece's"
5 ★★★★★ - "Have used Glenn and his crew several times over many years. The things that have remained consistent is top qualify work for a fair price. They will get all my business big and small." 5 ★★★★★ - "We absolutely love our new floor! Not only that, we were really impressed by the genuine concern and desire by the company to make us happy. At the beginning of the project, my husband took a picture at an angle that looked crazy to me when I wanted to see how it was going. I didn't like what I saw and was an hour and a half away from the house. The crew stopped their work, waited for me to see it with my own eyes and was willing to re-do the tile floor (which was halfway done at that time) if I didn't like the way it was laid down. They didn't give me a hard time, they were very courteous and kind hearted. When I got to the house, I was very surprised how I actually loved it! What touched me was their consideration of my feelings and their desire to make sure I was happy as a customer. The owner, Glenn, was very easy to talk to, was very professional and very helpful in everything. He left his wonderful crew to work on the floor but came to check regularly. More important to me than doing a great job is how the company itself relates with you --- and they were simply great! I would highly recommend them and would definitely use them again for future projects. God bless them!" 5 ★★★★★ - "Prestige Construction replaced our windows, installed hardwood floors and installed a custom handrail system for our home. The finish is beautiful and professiinally detailed. They finished on schedule and communicated with us everyday during the project. We cant wait to get our basement finished next year by Glenn and his team!" 5 ★★★★★ - "Completely Satisfied. Great Work!" 5★★★★★ - "I enjoy working with the company I like that everyone gets along with another! I have learned a lot since I have been there! And there's a lot more to learn! Thanks for putting up with me!" 5★★★★★ - "They have great service, great employees, and the best work. You get a high end job done that's well worth the money. I would definitely hire them to remodel my house, because I can rest at the end of the day knowing they are going to do an excellent job. Give these guys a call today!" 5★★★★★ - "Prestige Construction is the type of reliable and precise business America needs more of. Their before and after pictures are absolutely beautiful. I would highly and completely recommend their business to anyone wanting to modernize or beautify their home. 5 stars from me! " 5★★★★★ - "Very professional and reliable! If you have trouble seeing your vision Glenn helps you see it. Very on time and gets jobs done on time." 5★★★★★ - "Prestige Construction was the best company I have ever worked with. They said they would be out at 9am, they were there at 8:45. They said my new roof would be done in one day, it was done in about 8 hours (a full tear off and replacement). I will be using Prestige again for at least two more projects. Thank you so much for such a great work. Glad I finally have a company that is focused, trustworthy, multi-task capable, and efficient. Thanks again Glenn and the guys with Prestige. You will be hearing from me by the end of the summer!"